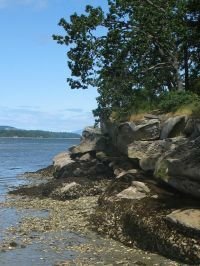 This is a beautiful example of the classic gulf island landscape – sandstone and dry forest. Duke Point is a very thin peninsula across the water from downtown Nanaimo, forming the eastern edge of the Nanaimo River Estuary. This is where the Duke Point ferry terminal is. Biggs Point is the name of the park along one side of Duke Point, leading to Jack Point, the park that covers the tip of the peninsula. The first 300m are wheelchair accessible and feature stunning views of Nanaimo Harbour and downtown. This is a very beautiful oceanside area that is usually mostly deserted. Trails meander through the arbutus and douglas fir, snaking high and low, a few metres above the ocean or right beside it. The shore is all sculpted sandstone, offering interesting shelters and designs. You can see sea lions and sometimes otters, plus eagles and, if you're very lucky, orcas. 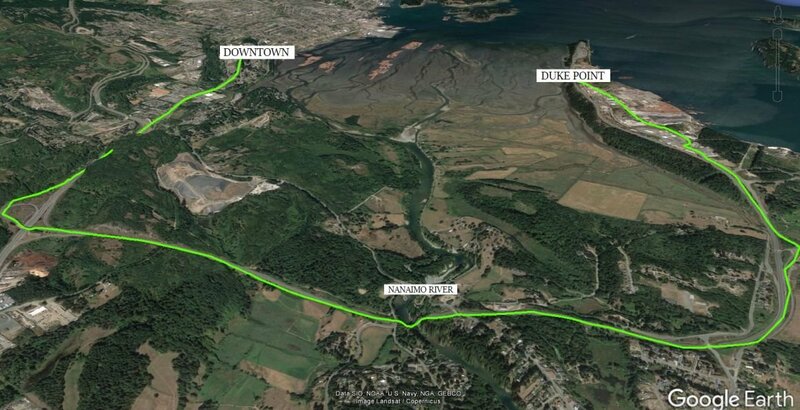 Duke Point is a 15-20 minute drive from downtown Nanaimo. Follow the highway that takes you to the Duke Point Ferry Terminal, and watch for the last right-hand turn before the terminal (it's long before you can see the terminal). The street is called MacMillan. It will become Maughan Rd (stay left) and you eventually see a small parking area beside the highway. Park, and walk through an underpass to the parks.